I have been increasingly drawn to chasing down nebulas. I blame the Great Orion Nebula. M42 can be seen any winter night, even in the face of significant LP in the suburbs, but I'm motivated to see more of the much less conspicuous nebula. Up until just last week, I confess to only occasionally (and barely) observing the nebula surrounding some of the main stars within M45 without the use of any filter. A recent post by one of our most experienced visual observers on AF has pushed that inspiration. (Thanks again, JG - I'm going to treat this as my new nebula shopping list while Orion's constellation is still with us). So, I have bought a 25 mm Televue plossl to take advantage of gaining the best exit pupil for the job, using my fast Newtonian (25 mm fl/ 4.7 fl = 5.3 mm exit pupil), in combination with a Lumicon UHC filter. The narrow-ish field of view may be actually an advantage in allowing isolation of the smaller nebula, away from the glow of very bright stars, such as Altinak, in Orion. One thing I like, the Lumicon 1.25" filter screws all the way into the seat of this EP, eg, it fits beyond one or two turns, unlike almost all of the cheaper plossls that I own. I'd like to try now a Baader blue(RGB)CCD filter to allowing for nebular light while cutting skyglow and light pollution. Yet another possibility - the NPB filter by Omega Optical. 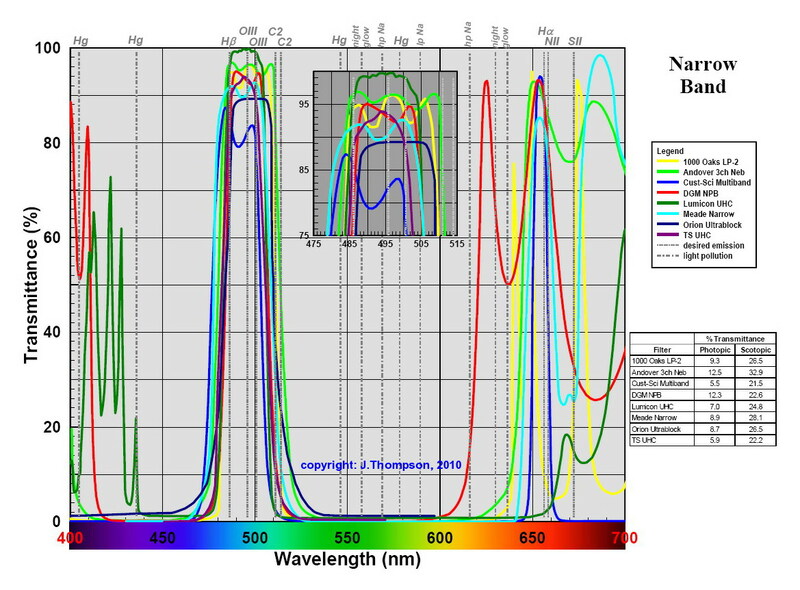 Here is the link of the test results of the NPB filter. I'd be interested to hear whether anyone has tried them. Last edited by kanadalainen; 03-10-2019 at 05:18 PM. j.gardavsky, not_Fritz_Argelander, helicon64 and 11 others like this. Interesting report. I've not tried them. I've gotten very happy with the Baader H beta CCD (8.5 nm) filter. I'm finding that the narrower filters give better results. Davesellars, SpyderwerX and kanadalainen like this. Great choice, Ian. The TV plossl's never disappoint me. The throughput and contrast are top of the line. Some folks balk at he narrower FOV, but many times, as you noted, I find it beneficial. Perhaps the 20mm next, to tweak that exit pupil and contrast just a tad? It's a great nebula filter, but I have never compared it directly with the Lumicon. Of all the current offerings, and admittedly after somewhat limited testing, I currently prefer the TeleVue Nebustar II. Compared directly to the Astronomik offering, I feel it offers "slightly" better rendering. Probably due to a steeper cutoff at the red end of the spectrum. j.gardavsky, not_Fritz_Argelander, Bigzmey and 2 others like this. as you already have the Lumicon UHC which is very good, other UHC filters, including the NPB, will not yield enough improvement to justify a purchase, regardless of the costs. This filter has offered me the first time view of the Crescent Nebula in Cygnus under not very good observing conditions. Your 10" Newton has just enough aperture for this extremely narrow filter with the exit pupils in the range 5mm - 7mm. I have three pieces of this filter a pair in 1.25", and a single in 2". So, depending on how you feel about your LP, I would choose the one or another OIII. Otherwise, your Tele Vue Plössl 25mm eyepiece excells in disciplines of transmissivity and contrast, congratulations! not_Fritz_Argelander, DeanD, Davesellars and 5 others like this. Congrats on the new glass Ian! I am with JG. You already got a nice quality narrow band filter. Getting NPB would be more of the same. You should consider OIII and H-betta instead. j.gardavsky, Bigzmey and kanadalainen like this. Thanks I - the report is a good read. I have the 2" DGM NPB filter - It does work well, though I tend not to use it that much - as I tire of taking it on & off during a session. if you prefer red Green stars. A thread started back in '15 if you have some time there is some great input from our resident experts. Best of luck I - Happy Hunting! Thanks JG, the Baader OIII sounds great. I really appreciate your advice! Makes sense, Andrey, I'm kind of glad I asked too. Always. I spent too much time dreaming about the next piece of hardware. Thank you Frankie. The Big 25 TV Plossl has always been one of my favourite EP's. My Lumicon UHC and OIII filters also thread nicely onto my 25mm TV. Which, quite frankly, has always intrigued me considering how weird Lumicon threads are lol. DSLR Deep Sky Imaging: Far Thee Well Catalina...A Parting Shot.